Everyone is welcomed! 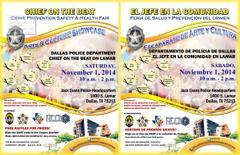 "Chief on the Beat" Crime Prevention & Health Fair will be held for the 1st time at Jack Evans Police Headquarters - 1400 S. Lamar on November 1, 2014. We hope to see you there!